A misanthropic matriarch leaves her eccentric family in crisis when she mysteriously disappears in this whip-smart and "divinely funny" novel that inspired the movie starring Cate Blanchett (New York Times). Bernadette Fox is notorious. To her Microsoft-guru husband, she's a fearlessly opinionated partner; to fellow private-school mothers in Seattle, she's a disgrace; to design mavens, she's a revolutionary architect; and to 15-year-old Bee, she is her best friend and, simply, Mom. Then Bernadette vanishes. It all began when Bee aced her report card and claimed her promised reward: a family trip to Antarctica. But Bernadette's intensifying allergy to Seattle--and people in general--has made her so agoraphobic that a virtual assistant in India now runs her most basic errands. A trip to the end of the earth is problematic. To find her mother, Bee compiles email messages, official documents, and secret correspondence--creating a compulsively readable and surprisingly touching novel about misplaced genius and a mother and daughter's role in an absurd world. Maria Semple is the author of This One Is Mine and Today Will Be Different. Before turning to fiction, she wrote for Mad About You, Ellen, and Arrested Development. Her writing has appeared in The New Yorker. She lives in Seattle. 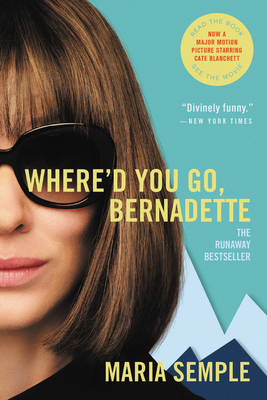 "The characters in Where'd You Go, Bernadette may be in real emotional pain, but Semple has the wit and perspective and imagination to make their story hilarious. I tore through this book with heedless pleasure." "This book is hysterical, kind of wacky, and utterly original. "—Entertainment Weekly's "The Bullseye"
"One of the big burst-of-oxygen books this year.... clever and inventive but also genuine and heartfelt. "—Gillian Flynn for The New York Times' "Inside the List"
Copyright © The Bookstore Plus Music & Art, Inc.